Does Affiliate Marketing Really Works and How To Become an Affiliate? For people who would like to earn some money, or even a full-time living online, affiliate marketing is a very popular choice. Being an affiliate means that you are selling someone else’s product and when you make a sale, you will earn a commission. Affiliate marketing is popular because you can earn good money without the need to create your own product and without any of the customer service hassles that come along with being a product owner. Things like dealing with product delivery, returns, support issues etc. 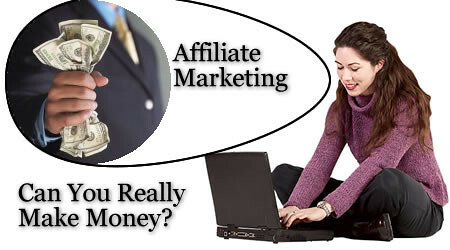 A lot of people ask themselves the question, does affiliate marketing really work? Some people have tried multiple ways to make money online and have not seen any success. When that happens, they start to question whether this stuff really works or if it’s all just a big scam. Affiliate marketing really does work and a lot of people make a very good living as an affiliate marketer. On this page we are going to tell you what it takes to become an affiliate, but not just any affiliate, a successful one. Before you can become an affiliate, you have to find a niche and a product to promote. A lot of people suggest getting involved in a niche that you are interested in because you will already be knowledgeable about the subject. For example, if you are into nutrition and exercise, getting into the weight-loss niche would be something that might be easy for you. When you have an idea of a niche that you would be interested in, you need to find a product to promote. You can do a search online for “your niche” “affiliate program” and you can find products that you will be able to promote. You can also start by visiting popular affiliate networks like Click Bank, Commission Junction, Share a Sale, or you can visit certain online retailers and see if they offer an affiliate program. The biggest online retailer in the world, Amazon.com has an affiliate program that will allow you to sell almost any imaginable product across a wide range of niches. To become an affiliate simply requires filling out an online form at an affiliate network website or at the website of an online retailer that offers an affiliate program, and then waiting to see if you are accepted. Some affiliate programs require that you have a website so you will have to register a domain name and start a website. Registering a domain name is easy. You can go to a site like GoDaddy or Namecheap and register a domain name for $10 to $15. You will also need to sign up with a web host that will host your website. Hosting can often be purchased for about $10 per month. When you have registered a domain name and set up a hosting account, you can build your website. You can build a website with an HTML editor, you can use a content management system like WordPress, or you can even outsource website creation to someone if it is a task you are not comfortable with. This article is about affiliate marketing and not about designing a website so we must move on. However, you can find a lot of helpful tutorials on a site like Youtube. With a quick search you will be able to find free information on everything from registering a domain name, to setting up a hosting account, setting up the domain servers, and even installing content management systems and website design. Once you have a niche and a product selected, you have signed up for an affiliate program, and you have your website and hosting ready to go, you need to start getting traffic to your offers. If no one sees your offers, no one will buy anything and you won’t make any commissions. There are a number of ways to get traffic to your website and to your affiliate offers. There are a number of different types of advertising that you can pay for and there are also a number of ways to get free traffic. We’re going to focus on some free traffic methods. One great way to get traffic to your website, that doesn’t cost anything except some of your time, is to participate in niche forums. If you are in the weight-loss niche, promoting some type of nutrition or fitness product, you can join some of the top weight loss forums and become an active part of the community. Answer peoples questions and share useful information and you will become a trusted member of that forum. Most forums also allow you to have a signature where you can link to your website and that signature with your link will appear underneath every forum post that you make. When you develop a good reputation on a forum, people will be interested in what you have to say and seek out more information by clicking the link to your website. Forum marketing is a great way to get laser targeted, free traffic. Some other ways to get free traffic to your offers would be to do some guest posting on other blogs in your niche, answer questions on Q&A sites like Yahoo Answers, or produce YouTube videos giving information that would be interesting to people in your niche or providing product reviews about products that your target market would be interested in. Obviously, the information above is not a comprehensive guide on how to go from beginner to successful affiliate marketer. But if you follow the tips outlined above and continue to educate yourself on various Internet marketing techniques, there’s no reason you can’t become a very successful affiliate and make a very healthy income online. John Gibb is founder/owner of healthywealthyaffiliate.com, a leading website about how does affiliate marketing work. For more details on what it takes to become an affiliate, get in touch with John. You're here: AIM Home » Internet Marketing » Affiliate Marketing » What It Takes to Become an Affiliate – Does Affiliate Marketing Really Work?